One of the questions I got lately is how to select a specific text from a resource bundle and use it in an ADF Application. This is easy and can be done as shown below. 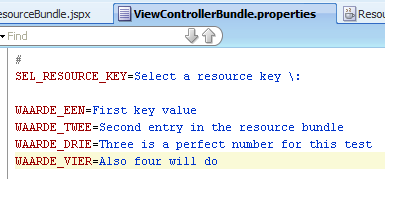 All you need is a resourcebundle containing the keys and text values, a selectcomponent to set the actual key and some java code in a valueChangeListener to search the resourcebundle for the key. 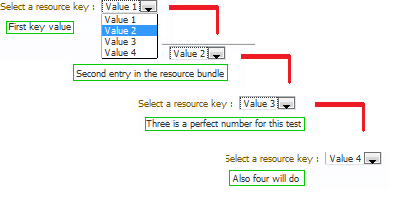 So first create the resourceBundle file to hold the key/value pairs for the text resources. Next implement the page holding the selectcomponent, and an output component to show the value retrieved from the resourcebundle. Finally implement the valueChangeListener in which we get the choosen value from the resource bundle. And now with changing the selection in the listbox, the value of the text shown in the output text (in the green box) component is read from the resourcebundle and refreshed.